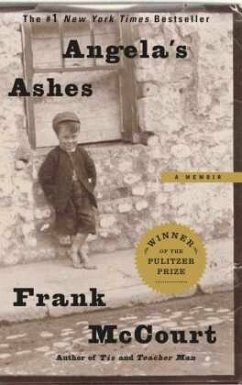 Imbued with Frank McCourt's astounding humor and compassion, Angela's Ashes is a glorious Pulitzer Prize-winner that bears all the marks of a classic. "When I look back on my childhood I wonder how I managed to survive at all. It was, of course, a miserable childhood: the happy childhood is hardly worth your while. Worse than the ordinary miserable childhood is the miserable Irish childhood, and worse yet is the miserable Irish Catholic childhood." So begins the luminous memoir of Frank McCourt, born in Depression-era Brooklyn to recent Irish immigrants and raised in the slums of Limerick, Ireland. Frank's mother, Angela, has no money to feed the children since Frank's father Malachy, rarely works, and when he does he drinks his wages. Yet Malachy does nurture in Frank an appetite for the one thing he can provide: a story. Perhaps it is a story that accounts for Frank's survival. Wearing shoes repaired with tires, begging a pig's head for Christmas dinner, and searching the pubs for his father, Frank endures poverty, near-starvation, and the casual cruelty of relatives and neighbors-yet lives to tell his tale with eloquence, exuberance and remarkable forgiveness. Frank McCourt (1930-2009) was born in Brooklyn, New York, to Irish immigrant parents, grew up in Limerick, Ireland, and returned to America in 1949. For thirty years he taught in New York City high schools. 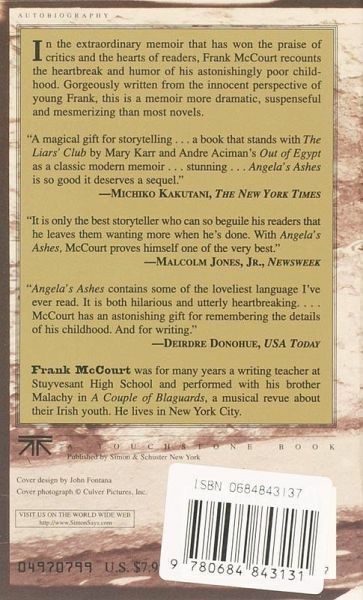 His first book, Angela's Ashes, won the Pulitzer Prize, the National Book Critics Circle Award and the L.A. Times Book Award. In 2006, he won the prestigious Ellis Island Family Heritage Award for Exemplary Service in the Field of the Arts and the United Federation of Teachers John Dewey Award for Excellence in Education. Great story and great way of storytelling. It opened my eyes to a new world. Before reading this book, I couldn't imagine how severe poverty could be. I recommend reading it. Ein großartiges Buch, das Humor und Melancholie vereint, vor Situationskomik nur so strotzt und den Leser im nächsten Moment über die Härten einer irischen Kindheit des 20. Jahrhunderts den Kopf schütteln lässt. Absolut empfehlenswert. Das Buch hat mir sehr gut gefallen. Manche Erlebnisse schockieren und bringen einen zum Nachdenken - andere wiederum sind wirklich witzig. Insgesamt ist das Buch wirklich gelungen. Auch nach dem Ende lässt es einen lange nicht los. SUPER! Ich fand dieses Buch sehr gut, auch wenn ich anfangs Proleme hatte in das irische Englisch reinzukommen.